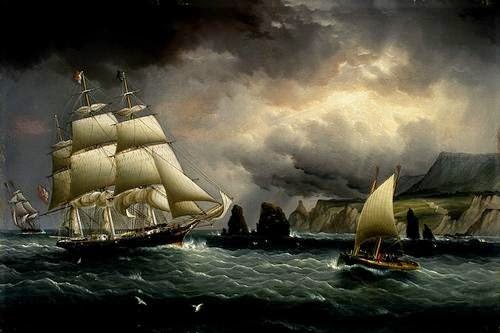 The Clipper Ship "Flying Cloud" off the Needles, Isle of Wight, by James E. Buttersworth, 1859-60. While they share the same name, this is a different vessel from the one in the recitation below. In June of 2000, I was in the community of Conche on Newfoundland's Great Northern Peninsula, doing work on heritage buildings for the Heritage Foundation of NL. I had the luck to meet Mr. Patrick "Uncle Paddy" O'Neill. He was introduced to me by his niece, Joan Woodrow, and while we were talking, he started to do a recitation of an old ballad called "The Flying Cloud", which he had learned from a man named Pat Bromley around 1941. Using spare tape and an old tape player Mr. O'Neill had, I made a very rough recording of the traditional ballad, which I've transcribed below. Uncle Paddy is no longer with us, but his version of the lyrics live on! I've seen it described as an anti-piracy ballad. If you have comments, leave them below, or email me at ich@heritagefoundation.ca. And taught me to be wise. Where the sugar cane do grow. Were mounted on her deck. On a swivel used to go. Take sixteen from the reel. From their native land we bore. Was all allowed to go. If they were in their graves. And threw them in the sea. Till their sad career was run. And scour the Spanish Main. And went with them on shore. The dead man tells no tales. Could catch the Flying Cloud. Was more than they could do. And soon we fell behind. There flowed a crimson tide. We had to surrender then. To be hung at last. Her sweet voice no more will hear. I now must meet my doom. Cut in my youth and bloom. Thanks Dale, so glad you recorded this. I used to ask him to recite it often, but would never have remembered it! Both Mom (Paddy's sister) and I have enjoyed reading it and remembering him. She tells me people used to sing it.